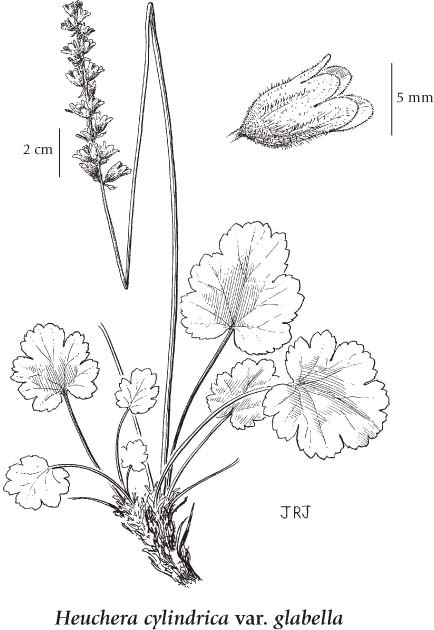 Perennial herb from short, thick rhizomes; stems erect, 15-90 cm tall, smooth to finely glandular-hairy or stiff-hairy below, glandular-hairy above, naked or with 1 to 3 brownish or greenish bracts. Basal leaves egg-shaped to nearly heart- or kidney-shaped, 1-6 cm wide, shorter or longer than wide, palmately-lobed, the lobes round-toothed, smooth or finely glandular-hairy to stiff-hairy; long-stalked, the stalks smooth to minutely glandular short-hairy or with conspicuous white hairs intermixed with short glandular hairs; stem leaves lacking; stipules membranous, fused to the leaf stalks. Inflorescence spike-like, becoming open, 3-12 (20) cm long; petals white to greenish-yellow, 5, often absent or partly absent, linear, much shorter than calyx lobes; calyces greenish-yellow to cream-coloured, narrowly bell-shaped, joined to ovary almost to top, the free hypanthium slightly to strongly lop-sided, equal to or longer than part joined to ovary, lined with a thin to thick, somewhat glandular disk, calyx lobes 5, oblong-lanceolate to egg-shaped and overlapping, erect, longer than the hypanthium; stamens 5, opposite and shorter than calyx lobes. Capsules, 6-10 mm long, opening along the beaks; seeds dark brown, 0.6-0.9 mm long, with lengthwise rows of slender, straight to curved spines. Four intergrading and largely sympatric varieties occur in BC . 1. 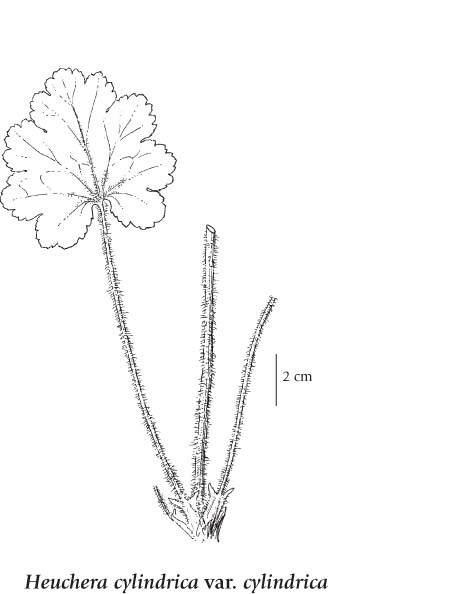 Leaf stalks smooth to minutely glandular-short-hairy; plants mainly of SE BC. 1. Leaf stalks generally with conspicuous white hairs intermixed with short glandular hairs; plants mainly of SC BC. Dry to mesic rocky places, cliffs and talus slopes from the lowland to alpine zones; common in S BC in and E of the Coast-Cascade Mountains; E to SW AB and S to WY, ID, NV and OR.